It is true the Academy Awards are not the ultimate arbiter of quality and longevity of a film. You need but look to the history of winners and losers to confirm that. However, the Best Foreign Language Films is one category where the Oscars gets closer. Nearly all nominees are multiple award winners with buzz that has carried them through the festival circuit, and led to their distribution in specialty movie houses. Director Sebastian Lelio’s genre-busting meditation on grief and change, A Fantastic Woman, is one of them. One of 2018’s five foreign film Oscar up for an award, it is not only worthwhile viewing, it represents the first time in Oscar history a film with a trans lead is nominated. It joins another historic first, the trans director Yance Ford being nominated for his documentary film Strong Island, showing this year at the Academy Awards as a step forward for acceptance of trans individuals in front of and behind the camera in the film industry. 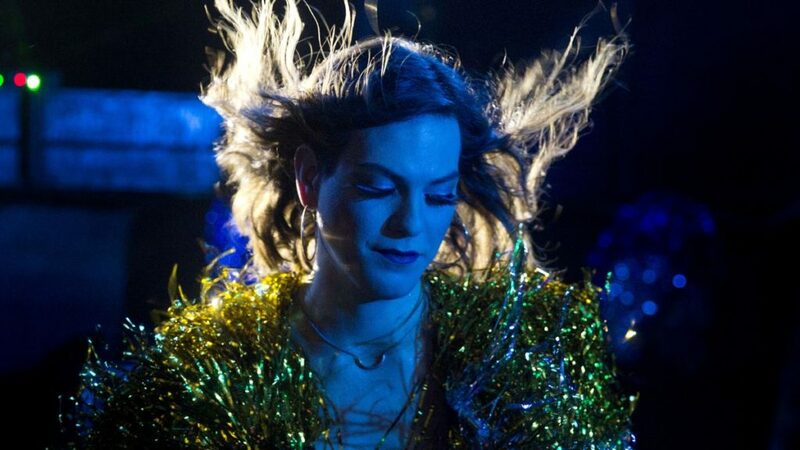 A Fantastic Woman is the personal odyssey of one trans woman moving through the first days of loss. Aspiring singer Marina is in love and planning a future with her lover Orlando. They live joyfully together in his apartment. One night after celebrating Marina’s birthday, Orlando is stricken with a sudden illness, and Marina rushes him to the emergency room. He dies just after reaching the hospital. As Marina tries to process the news, she is treated with suspicion by all around her. The doctors, the police, and Orlando’s family, don’t understand why Marina, whom some insist on calling by her dead name, would be living with a man 20 years her senior. Did she do something to cause his death? Inappropriate questions, pervasive mistrust, and rejection from his family, who see her as a perversion, invade Marina’s waking life as she struggles to make sense of her loss. Daniela Vega, who plays Marina, is in nearly every scene of the film. For an actress who has newly discovered a passion for the craft, she portrays her character in A Fantastic Woman with a level of intensity and authenticity that proves essential to its success. For those in Hollywood who continue to use the excuse that there isn’t enough talent within the trans community to cast them in trans roles, or indeed any roles, need but look to Vega. Truth be told, her triumph as Marina should simply reaffirm they could look in their own back yard, hire the many talented trans members of AFTRA-SAG, and help them rise to the Hollywood A-list. Director and co-screenwriter Lelio has said A Fantastic Woman is not simply a cause film. It is a film meant to transcend genre. In fact, he is quoted as saying he wanted to make a trans-genre film about a transgender woman. In A Fantastic Woman he incorporates elements of a fantasy, a thriller, a character study, and a ghost story. There are several scenes where Marina breaks with reality and imagines herself moving beyond the limitations the situation has created for her. They are among the film’s most beautiful moments. In A Fantastic Woman, It is through imagination and strength that Marina finds freedom from within a very dark situation. The film may be groundbreaking in terms of getting attention for community that continues to be misunderstood, but it is the truth with which grief, which is universal, is represented, that audiences will find the greatest, and lasting, connection. LC: Was there a conscious decision to parallel the in-between world we experience when grieving with the in-between world of a trans person that too struggles to live between worlds? Sebastian Lelio: Yes, because I wanted to make a film that was more than a “cause” film, with a political statement. That’s part of the polymorphic aspect of the film, it’s part of the DNA of the film. It has different layers and faces. I just was trying to find ways to add more complexity to it. In that sense, this “in-between worlds” that you mention is really accurate, because the entire film is based on that premise. Everything is in-flux and somehow the mourning process that she’s going through provides an exceptional moment which allows many things to happen. It’s an open door towards freedom. SL: The concept of making a trans-genre film about a trans-gender person was very important, so the film combines and flirts with different tonalities and different traditions, like thriller, romance, ghost story, character study, a film about a woman, and these fantasy moments the movie has an enhanced reality, or a trance reality. While I was writing the script, I was following very closely the mourning process of someone very close to me, my sister, and that was super important. It made it’s way into the script. The paradox is that the story pure artifice. It’s not a documentary, and it doesn’t want to be realistic. It’s really about fiction mechanisms that make a story work. The result, the effect, is, “Wow I’m watching someone real, it feels real!”, but if you analyze it as a device, it’s pure artifice. That tension is one of the sources of the film’s identity, precisely because it’s about a trans-genre film about a trans-gender person, interpreted by a beautiful, talented force of nature called Daniela Vega. The film explores the question What is a woman? from many different angles. I am a filmmaker. That’s my cause. The film itself wonders, “What am I? What is a film?” In that sense, the film’s quest or search for it’s identity is deeply connected with it’s main subject of study, Marina, who’s identity is, as well, not easily graspable. It operates in a realm where labels are not enough. That’s interesting, because if there’s anything that this film is against, it’s against labels. A Fantastic Woman is trying to make labels explode. LC: You’ve said in playing Marina, you see problems as possibilities, you built the character from there. Can you speak to that in terms of this role, and how you see her as universal? Daniela Vega: I see my job as actress as a very serious job. When a character, comes into me, I like to pull from many elements around me. It’s very interesting and very important for me to build that character in a way that she becomes really relatable to people around the world, but also be unique and individual, and yet I see Marina as a universal woman for three very simple reasons. Everyone is going to fall in love, everyone has been rejected or at some point treated badly, and everyone is going to lose people they love and ultimately die. These three very important aspects of being human for me acted as an umbilical cord, or a way of connecting to the rest of the world. LC: Grief strips away layers. it’s what makes grief so terrifying and so numbing. This experience requires Marina to almost redefine herself moment to moment as she travels through grief. That is what makes her character so universally compelling, I think. How did you translate her in terms of that as an actress? DV: that was the hardest part for me, because nobody I’ve been close to has died. I studied how death and grief effects people in their bodies and in their heads, especially right after loss. This is a story that only takes place over three days. LC: What would you say the ghost of Orlando mean to your character in the film? DV: He’s saying where he is. She isn’t allowed to go to his funeral, so he’s saying “if you want to say goodbye, I’m here.” That’s the reason she sees him. She’s trying to figure a way forward in the situation. The family wants her to go away, to stay away, but she feels she has a right to say goodbye, so there’s a big conundrum. She feels she and Orlando are not separated, not apart. His conviction is an invitation to strength and a way forward for her. LC: In the US there’s a huge issue with studios hiring straight people to play gay characters, and cis-gendered people to play trans and queer characters. Can you comment on that. DV: That’s the world. It’s everywhere I think. Some places far worse than others, of course. In Chile they don’t accept us, but in the Middle East it’s even worse. It’s very dangerous. As to trans actors being accepted and hired, It’s certainly a natural progression and it has to happen. As to why it hasn’t happened before, I don’t have an answer. Sebastian Lelio: I’d like to add that since this is art, and in art we are all free to express without rules, I’m not trying to say this is the way it should be. If anyone wants hire a cis-gender actor to play a trans character, and the film touches beauty, of course they are welcome. This is not a fascist thing. We are not doing this to say this is a turning point. I’m not being moralistic, I’m just being ethical. That has nothing to do with art.